Prostate is a male organ. Normal size of the prostate is 25 grams and it enlarges with age due to hormonal changes. Enlargement of the prostate squeezes the urine pipe causes urinary symptoms. Enlargement of the prostate is called BPH or benign prostate hyperplasia. It is present in 70 percent of men above the age of 70. The urinary symptoms have no correlation to size of the prostate. Most of the urinary symptoms can be treated with change in life style and medications. About 20 to 30 % of the patient will need surgery. TURP or transurethral resection of the prostate is gold standard in treatment of BPH. Limitation of TURP surgery is that it cannot be utilized for prostate enlargement of more than 150 grams. Larger prostate need enucleating by open surgery. Open surgery needs longer hospitalization, more painful and may need blood transfusion. An alternative for large prostate is Laser prostatectomy. Laser prostatectomy is done using Holmium laser. 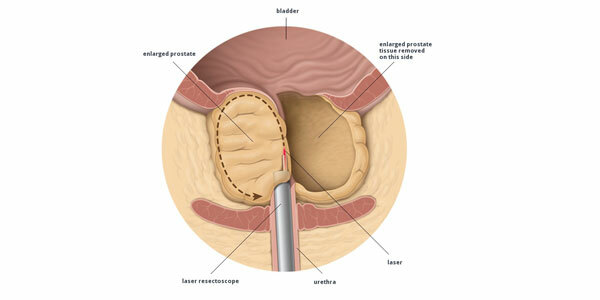 It is called Holmium laser enucleation or HOLEP (Holmium laser Enucleation of Prostate). The prostate lobes are enucleated with Holmium laser and pushed into the bladder. The prostate is then morcellated with a morcellator. The specimen is then send for histopathological examination. It is minimally invasive surgery and gold standard for removing of large prostate requiring open operation.